It is true that the portrayal of Muslims has been metamorphosed as that of bad characters, beginning from the late 1980s. In tough times, when the secular fabric of the society in a country like India is being torn apart, is there a sign of hope? Mulk – a recently released Hindi film produced and directed by Anubhav Sinha is one of the signs of hope! There have been many reviews of the film. But, I would like to begin forthright by producing the comments by the director. Sinha, when asked as to why he trudged such an attempt, which was full of challenges and perils, eloquently said that the present-day media houses, especially the television channels, have got converted into sheer propagandists serving the agenda of gulfing the gap in between the communities. They are further reinforcing the present ruling dispensation’s ideology by polarising them the communities. Hence, he said Mulk is a deliberate attempt and not tacit at all, to ensure that the basic spirit of the Indian society i.e. brotherhood is reinforced. 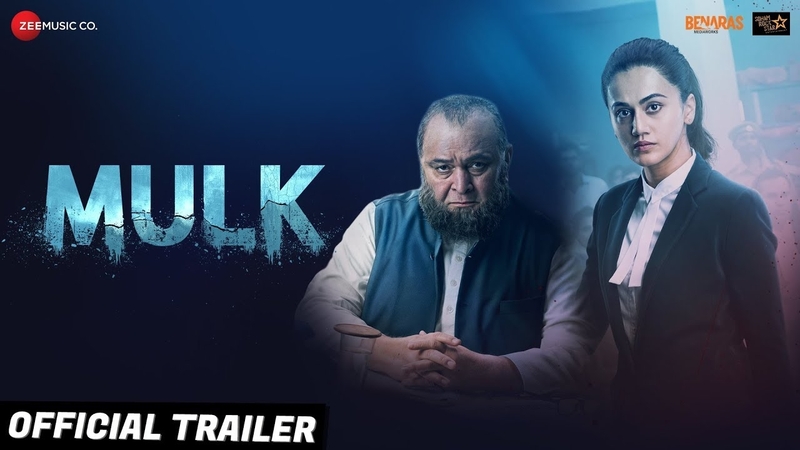 The movie Mulk is a story of a small town in UP, and revolves around the central character, Murad Ali (Rishi Kapoor), who is a reputed advocate, a Muslim of course, who has a well-settled family. The drama of the film is shot in a court room, which follows Murad Ali’s nephew Shahid’s (Pratik Babbar) killing by the police, as he was instrumental in a bomb blast. The story is woven around Murad Ali’s family – including his younger brother Bilal and (Manoj Pahwa) father of Shahid – being indicted by the police for abetting terrorism. Bilal is arrested, and dies in the jail, as he was sick and could not bear it. The case does not end there, and even Murad Ali is made as an accused, however, he is not arrested. Murad Ali’s case is pleaded by his daughter-in-law Kiran (Taapssee Pannu), who is a Hindu. The court room virtually becomes a playground for the modern-day discourse and drama being witnessed in real life in India nowadays. The prosecution led by Santosh Anand (Ashutosh Rana), who is not just castigating but extremely sarcastic in terming Murad Ali’s family terrorists, plays a role like an ideologue of the present ruling coterie. Dialogues like ‘All Muslims are not terrorists, but all terrorists are Muslims’ are used extensively. The sheer subjectivity of the individuals comes to play. These include comments from the prosecution like why Muslims are poor, more illiterate, produce more children etc. Another subjectivity to play in the film, which is new in the cinema world, is that of Danish Javed (Rajat Kapoor), who is the police officer, who could have arrested Shahid, but instead shot him dead. He being a Muslim has another form of prejudice, where even he is conditioned by majority communalism to believe that Muslims are terrorists, and that he has to take a direct action, and kill such bad Muslims. The central theme of the drama revolves around how Murad Ali is to prove himself to be somebody who loves his country – India. The narrative of the film has nicely been built on ‘us’ and ‘they’. ‘Us’ in the discourse is the majoritarian Hindu community and ‘they’ is the Muslim minority. It is against this background that Murad Ali performs a scintillating performance where he questions their authority to ask for a proof of his patriotism. This nation is as dear to him as to anybody else, he says. It was his choice that he stayed back in India. Another important role is of the judiciary. The judge, while acquitting Murad Ali, gives a long speech on the subjectivity of the whole drama. Important to note is his reference to the fringe elements who are bent upon making such a polarisation. He also shows the ‘constitution’ to be used as a weapon to safeguard the rights of the individual and that it (the constitution) does not differentiate on the basis of religion, caste etc. He further remarks, “In case they still do not listen, then we are there to take care of them”. For how long? Anybody’s guess! Another powerful portrayal is about the ‘common Muslim family’ being the general one in line of patriotism, unlike the comments made about a few Muslims like Abdul Hamid, Abdul Kalam and Ustad Bismillah Khan as exceptions. The narrative of the film is unambiguously clear that majority of the Muslims are like them; it is the terrorists who form the exception. To speak about the movie world in India, a story has been carried while reviewing Mulk as “Finally Bollywood has courage to look at Muslims as regular Indians and not as terrorists.” Shekhar Gupta, one of the senior journalists in the country, while writing a review of the film has described three different phases of Indian cinema. According to him, the first era is the post-independence era. There was a parallel genre of the “Muslim social”, with subtle romance, shayari and sort of middling feudal splendours, from Mere Mehboob to Pakeezah. The second happens to be the “angry young man” 1970s, the Muslim was the big-hearted, honourable man who usually sacrificed his life for his Hindu buddy. Remember Pran’s Sher Khan singing “Yaari hai imaan mera, yaar meri zindagi…” to humour Amitabh Bachchan in Prakash Mehra’s 1973 classic Zanjeer. Until the late 1980s, the Muslim, if featured, was almost always a good guy. The third one happens to be the Sunny Deolisation of the cinema where communalism became fashionable. Gadar- Ek Prem Katha was the worst such connotation according to him. One may agree with this corollary or not, but it is true that the portrayal of Muslims has been metamorphosed as that of bad characters beginning from the late 1980s. This is also true to the rise of communalism in India. It is the late 80s of the last century that the hatred spread across the country. The first culmination of the spree unleashed by communalism was the riots after the demolition of the Babri masjid. And then there has been no looking back. A 2011 study of 50 films with Muslim characters by Muhammad Ashraf Khan and Syeda Zuria Bokhari showed 65.2 per cent painted Muslims in bad colours, about 30 per cent were neutral, and only 4.4 per cent positive. Another interesting feature noticed outside the film in the cinema hall – though not very crowded – was that the viewers did not seem to cheer or whistle at the Muslim ridicule during arguments in the movie. The point is that this trend of portraying the whole ideology of ‘us’ and ‘them’, which the present dispensation under the RSS umbrella follows at least got a shrug, needs to be consolidated. Such voices of the common people can only reinforce the idea of brotherhood and unity in diversity. But let me share another incident which shows that the challenge is still quite large. Whilst writing this piece, I shared a post on the Facebook, condemning the attack on Umar Khalid and how important it is to resist them (the attackers). One of the comments was “Deshdrohi kaise bach gaya” (how is it that the traitor got saved). Of course I removed the contact, and the comment. Watch the movie, and strengthen your commitment to a secular India. Is the ‘Secular’ Government of Karnataka Succumbing to the Antics of the Right-wing Groups? Rajinikanth, an actor who has a huge fan base, especially in Tamil Nadu, has now found himself caught in the muck of a controversy.